At 12 noon exactly I stepped onto my soapbox and surveyed the vast expanse of unpopulated concrete between me and the River Thames. 3 boxes to my right, another female scientist had already pulled in an audience with her flagella balloons. With a deep breath I lifted my empty water bottle high and started “Who can tell me what’s in this bottle?” Some people drifted in my direction, and I was off on my SoapboxScience adventure. 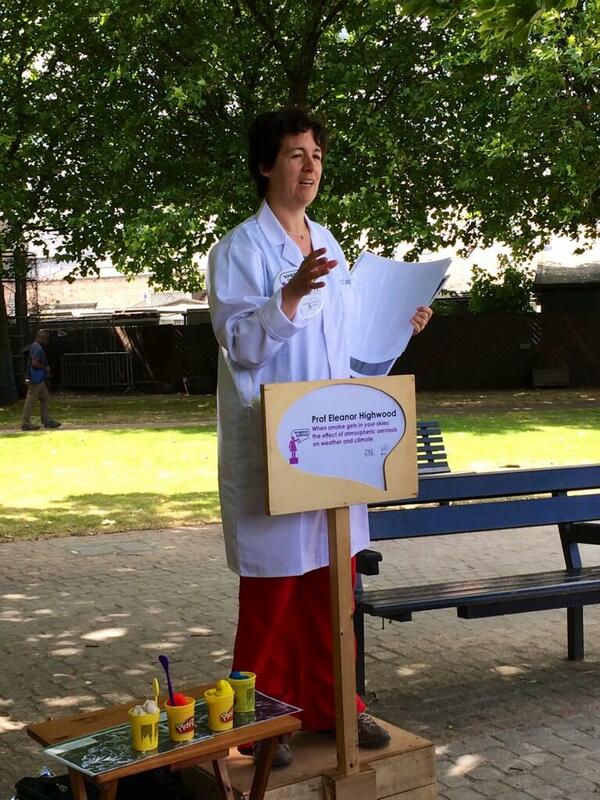 SoapboxScience involves 12 female scientists taking shifts on soap boxes on public thoroughfares talking about their research and their love of science. 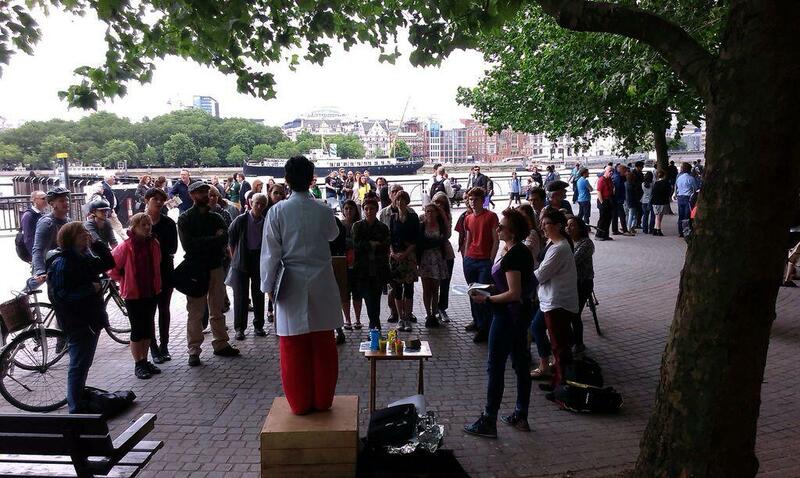 Sort of science street theatre. WITH NO POWERPOINT. In fact no power either. The project aims to raise the profile of science and female scientists amongst the general public via the style of public debate and discussion. For the past 4 years there has been an event in London, but this year there were also sister events in Swansea, Dublin and Bristol. The prop that was the most useful was the one that I thought I would only use in an emergency – a set of 4 scanning electron microscope images of different aerosol particles. I got people to “pick a card” and asked the group to guess what it was. Then I spent 3 mins talking about that type of aerosol, making sure I included the main points (aerosols scatter sunlight and aerosols make clouds) in every case. However, this also meant people stayed to see all 4 pictures which meant the “dwell time” was at least 10 minutes. Don’t make audience participation too contrived. I tried making an aerosol chains and balls out of humans to demonstrate the aging and coating process but it didn’t work so I dropped it after one attempt. I have an idea how to improve it for the future though so watch this space. The scariest part was trying to stop people just walking past without stopping, but I think I talked to around 80 people in the hour I was on the box and there weren’t too many awkward gaps. The first time I looked at my watch was 45 minutes into my hour long slot, and then it was over way too soon. I’d do it again tomorrow if I could.